It’s time! Not only is this a brand new musical, but it’s a CHOOSE YOUR OWN ADVENTURE musical. Come take part in this incredible new experience! The show will run roughly 45 minutes, and there will be four performances, at the Ritz Theatre in Oaklyn. 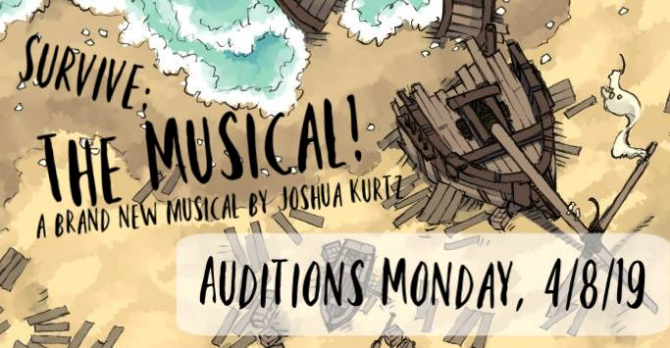 Rehearsals will be held weekday nights – the specific days and times will be decided when we have the cast, but it will be Tuesdays, Wednesdays and Thursdays as much as possible, avoiding Monday, Friday, and weekends. Survive: The Musical has just been accepted into the NJ Fringe Festival the first weekend in August. 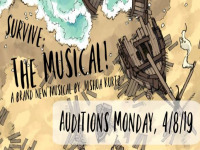 Auditions for that production will be held at a later date, but we will be retaining as many of the cast as we are able to from this production! Please prepare 16-32 measures of a song that showcases your vocal abilities – please bring a backtrack on CD or MP3 player, as no accompanist will be present! If you do not have access to an appropriate backing track, a capella will suffice. Please also bring a 30-90 second monologue of your choosing; comedic or dramatic. Be prepared to remain after your audition to cold read/sing some material from the show. Should callbacks be necessary, they will be held April 11th, the Thursday after auditions. Please keep this day open if possible! If you would like to audition, please reach out to josh@aftershockentertainment.org. When a delightful little cruise liner shipwrecks on a mysterious island, the six survivors must find a way to get to safety- but there are sinister forces at work. For on this island live malicious gods that want nothing more than to see these survivors suffer and die – and they’re not about to let anyone leave without a fight. Characters – Every character is meant to be a nearly blank slate, a type to be filled, so gender is irrelevant and vocal range is flexible. Audition for whichever one speaks to you! Death – The grim reaper, suave and charming, narrates the show and guides souls to the afterlife. Leopold – Captain of the cruise ship that crashes. Strives to please and strives to serve. Perhaps ever so slightly hotheaded. Loyal, upright, proud. Olivia – An I.T. consultant begrudgingly on a vacation since they weren’t allowed to get any more overtime than they already had. Workaholic, bitter, solitary. Sylvester – A B-list celebrity who thinks they’re all that. Can’t afford cruises like this, but goes on them anyway. Snooty, cowardly, entitled. Zippy – A kindly homeless person who stowed away on the ship, in hopes of scoring some free food and housing for a bit. Helpful, compassionate, optimistic. Rachel – A war veteran who has served in the armed forces most of their life. Doesn’t have time for anyone’s shenanigans. Direct, stoic, battle-hardened. Stevie – A low class worker on Leopold’s ship, has never liked the job. Doesn’t like people, doesn’t like ships, doesn’t really like anything. Vindictive, scheming, selfish. The Gods – Each of the six survivors have a mirroring god that is the antithesis of their original character. When a character dies, they become a god of the island, and continue participating in the show from that perspective. Angels of Death – The ensemble, aiding Death in guiding souls to the afterlife. No dialogue, but plenty of singing and movement work. This entry was posted in Uncategorized, Upcoming Performances. Bookmark the permalink.